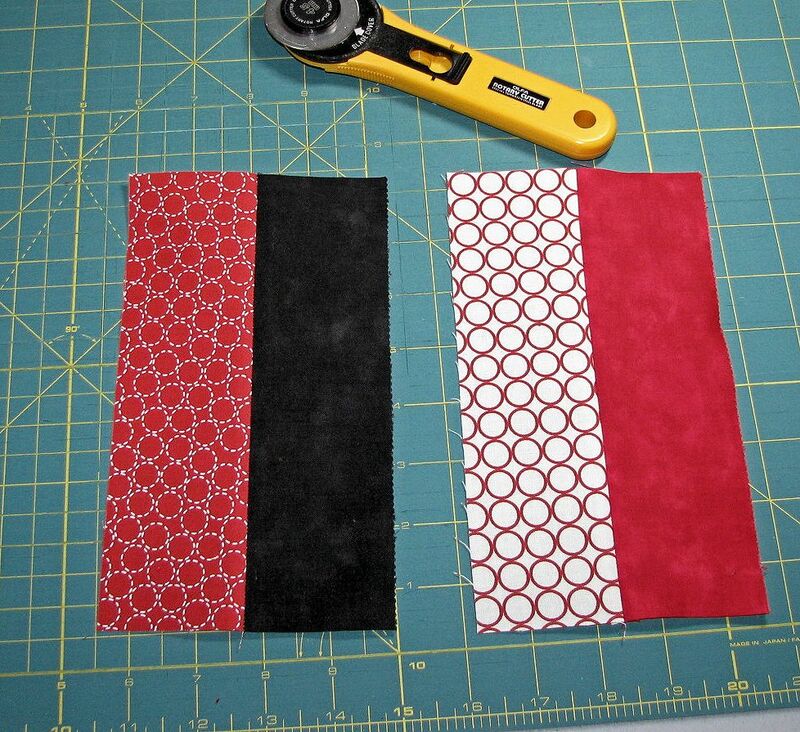 I took four – 2 1/2″ strips from pre-cut Jelly Rolls using two solids and two patterns to make two strip sets. 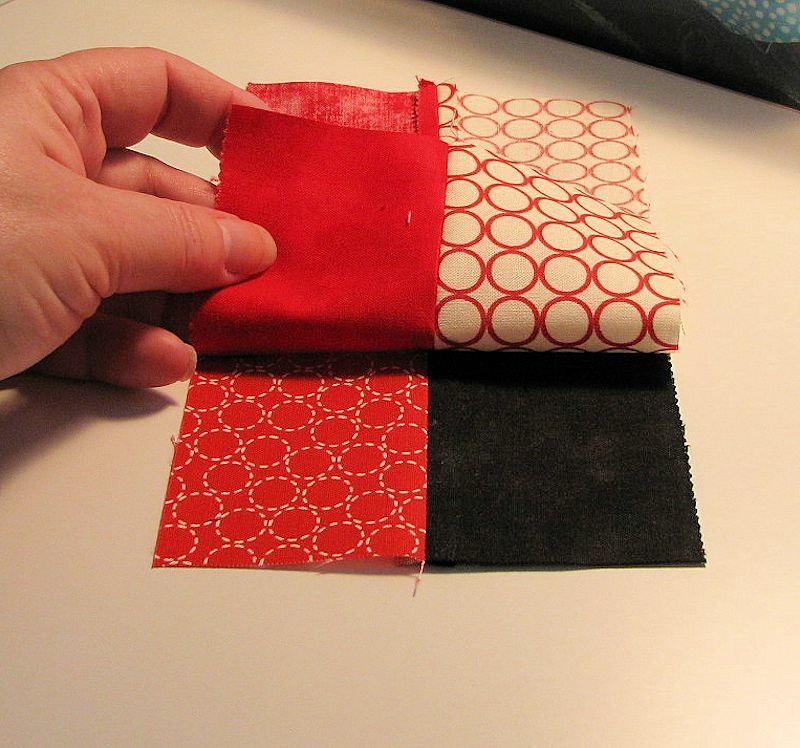 Sew one solid strip to one pattern strip using a 1/4″ seam. Sub-cut the strip sets into 8 inch lengths. 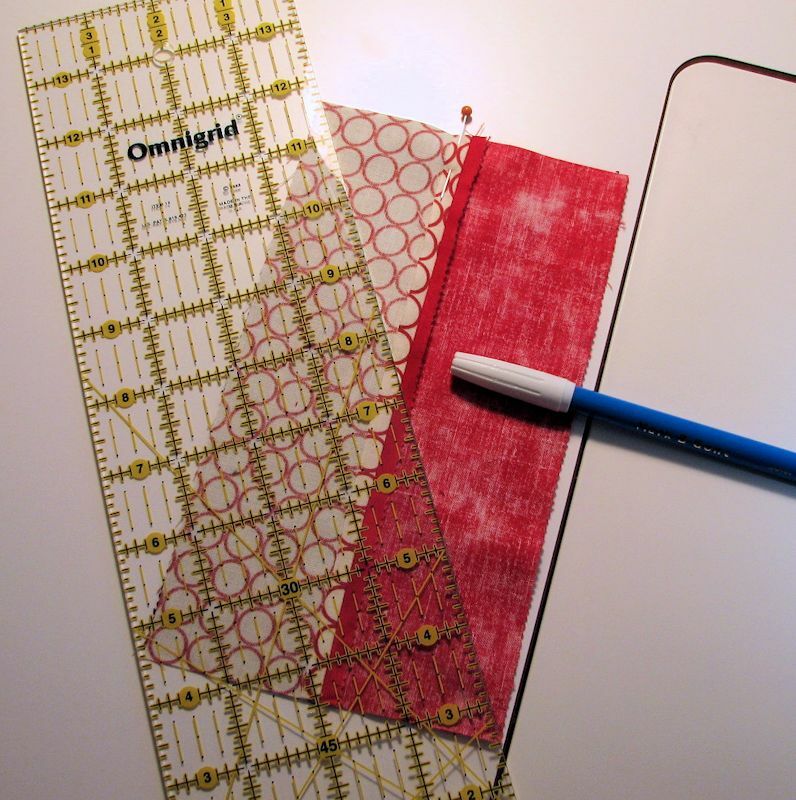 You end up with rectangles equaling 4 1/2″ x 8″. Draw a diagonal line on the back of one of the rectangles from corner to corner. 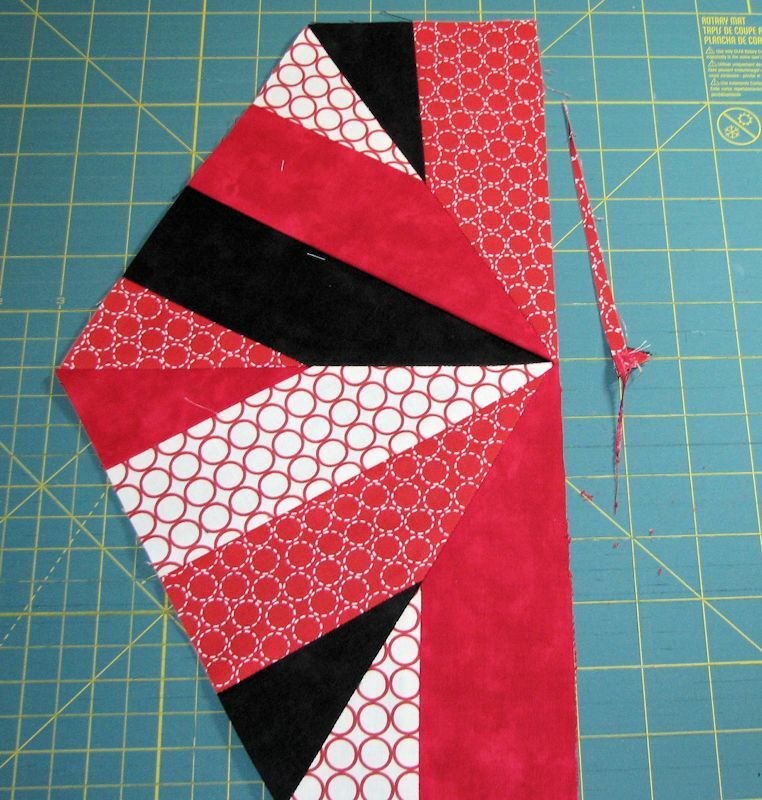 If you want each additional block you make to turn out the same, pay attention to from which corner and which strip set rectangle you are drawing the diagonal line. You’ll need to use the same rectangles and draw the same diagonal line in the same direction for each block you make to stay consistent. Take the rectangle on which you drew the line and place it on top of a rectangle from the other strip set, right sides together making sure a solid strip from one rectangle is on top of a print strip from the other. 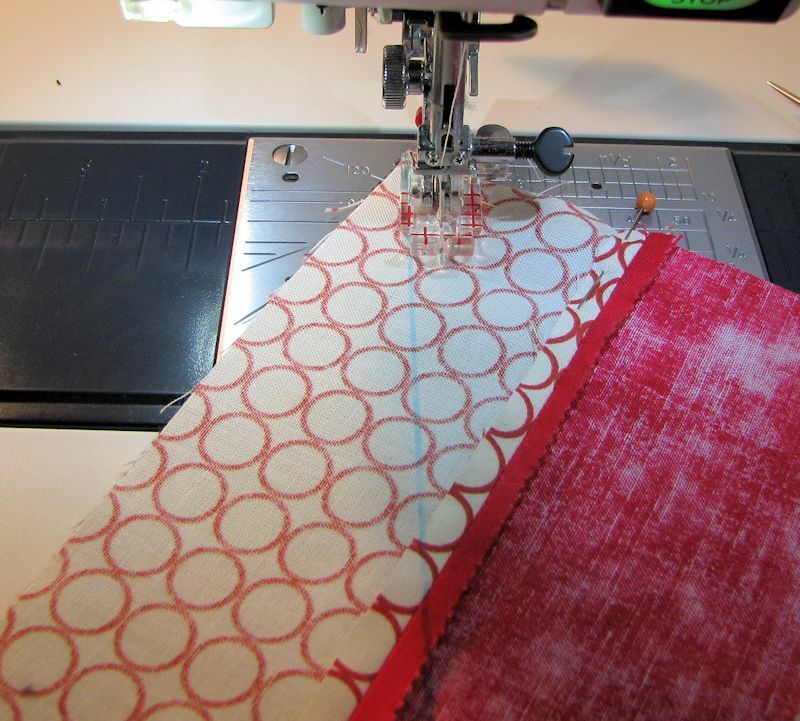 Line up your center seams. 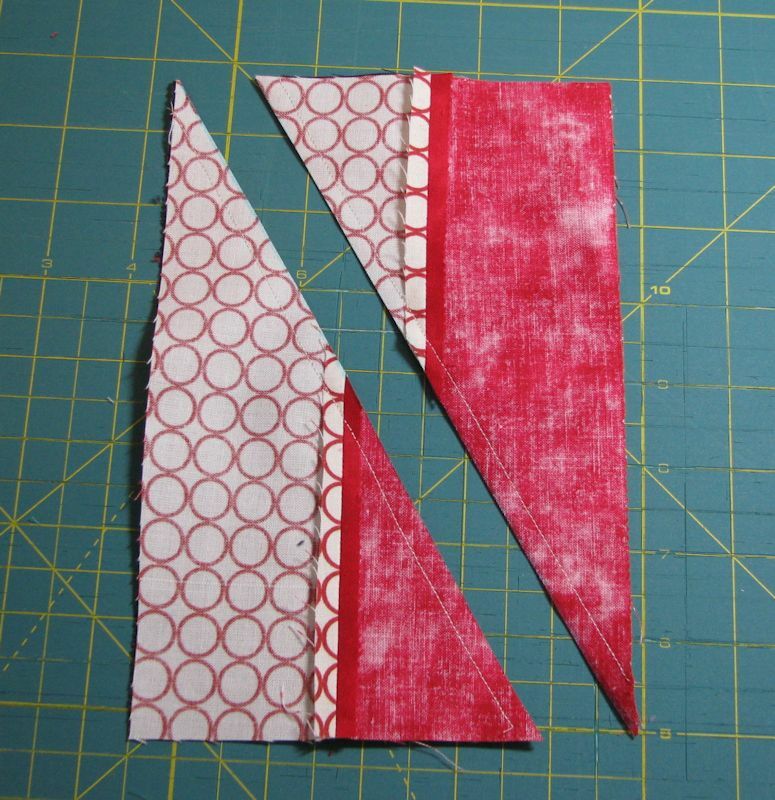 I pinned the two blocks together where the seams lined up to make them more stable for sewing my diagonal line. 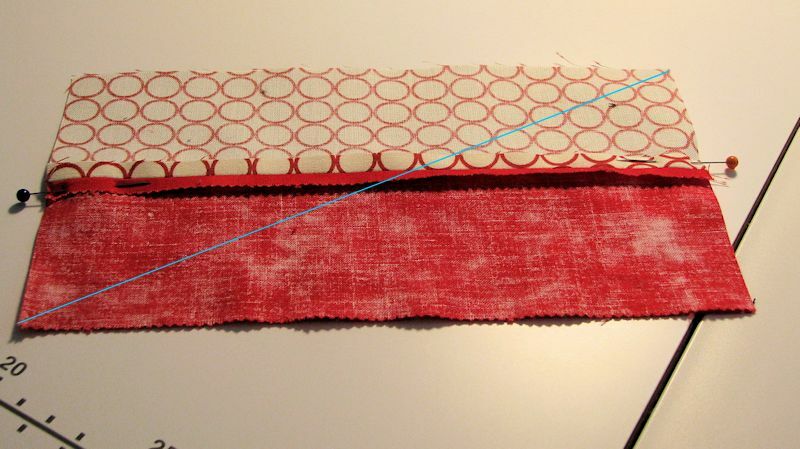 Stitch 1/4″ away from the drawn line, down each side of the line. 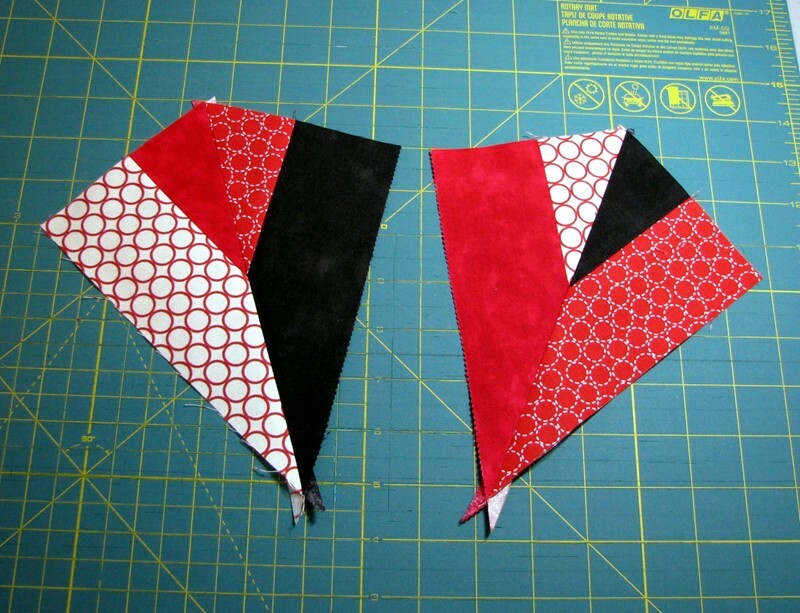 Cut down the drawn line to give you two kite-shaped blocks. I pressed the seams open on these blocks. 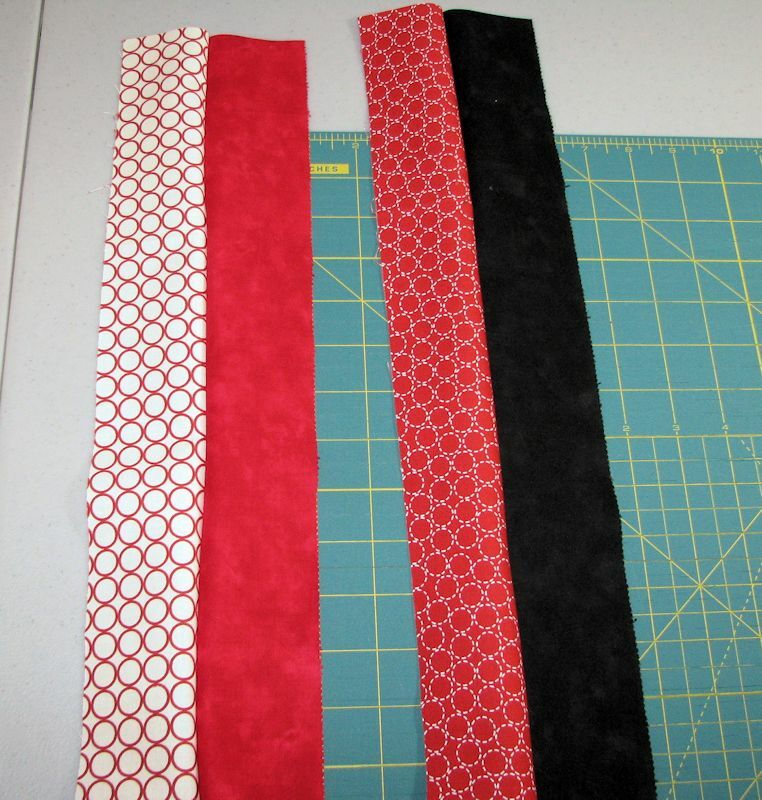 Before you sew them together you’ll want to trim off the little pieces (dog-ears) hanging off the ends. 1. 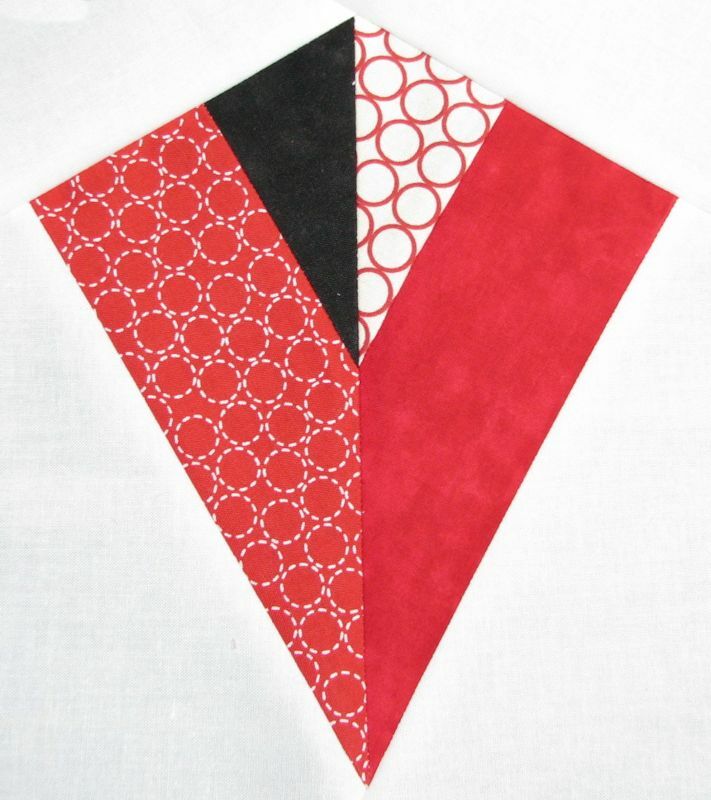 Sew three kites together along the long sides to make a “fan” shape. Here is the trimmed bottom after sewing them together. Now what would happen if I sewed two of the fan shapes together? I got a big hexagon. 2. 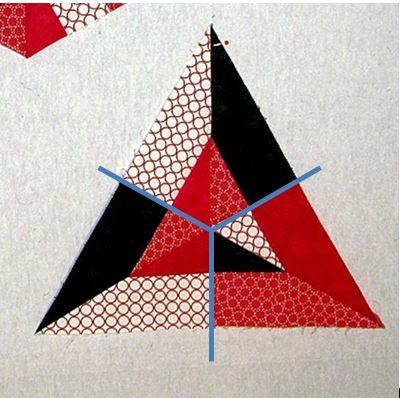 Sew the short sides of three kites together to make a triangle. 3. 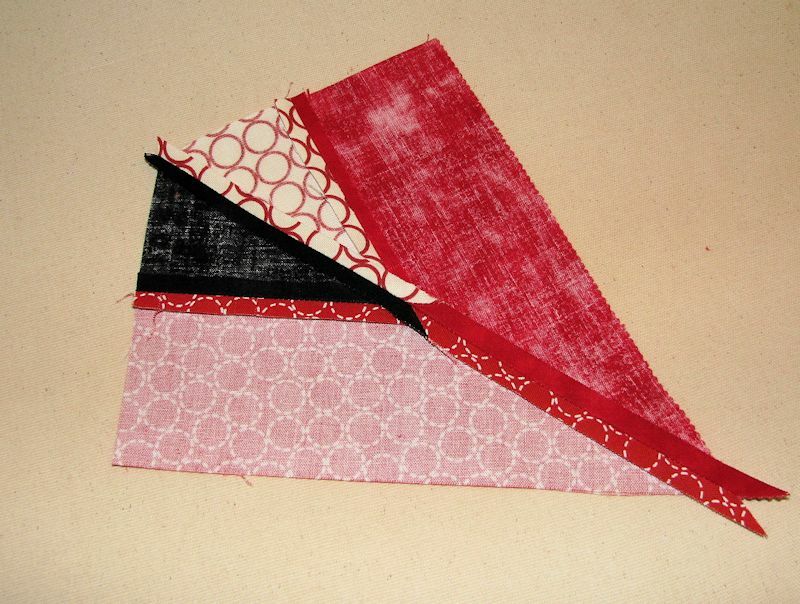 Sew oversized triangles to each side of the kite to form a square or rectangular block. Depending on how large you want to make the block or if it’s square or rectangle, you would have to determine what size triangle to use. I generally oversize them so I can cut it down rather than try to determine an exact measurement. For this experiment the colors were not planned. I just grabbed some strips I liked. 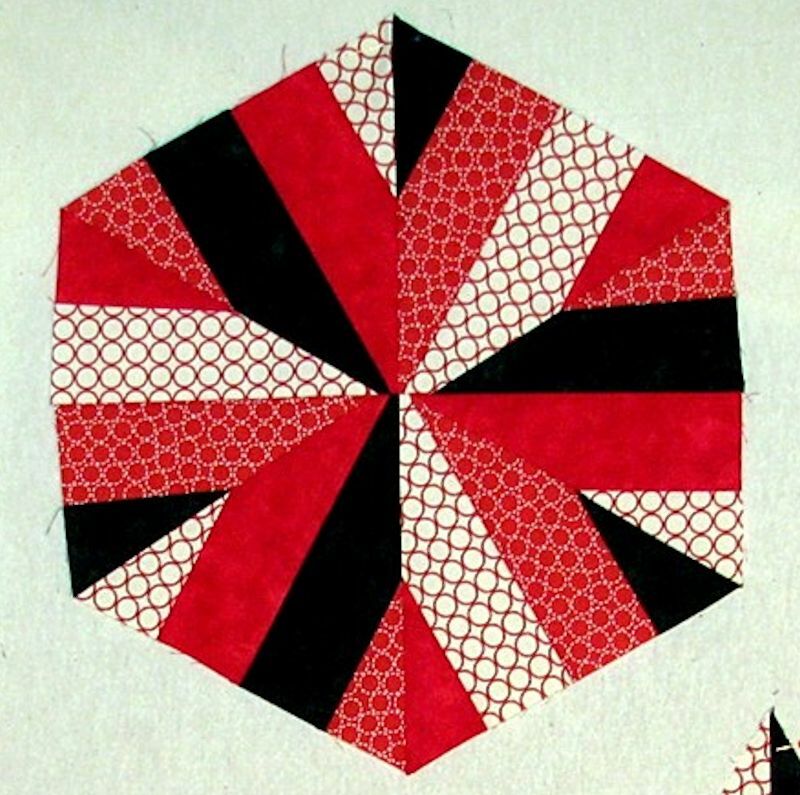 With more planning I think some wonderful quilts could come out of this technique. You could use just two colors, three colors, or four colors (as I did). 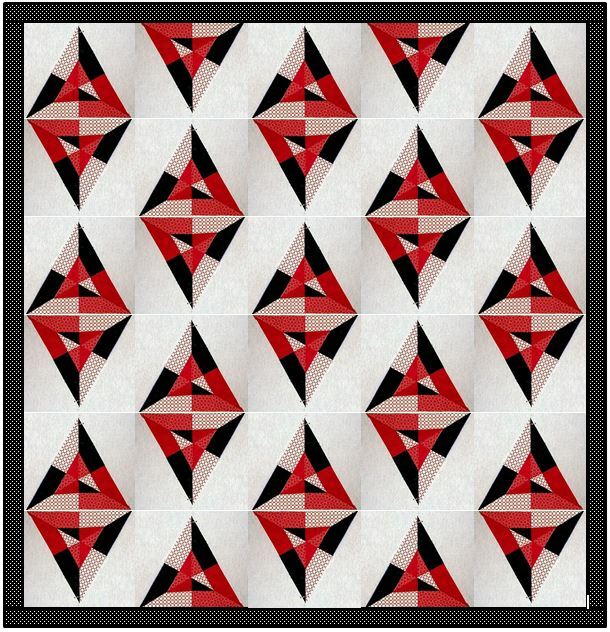 I am not a fan of how the reds meet up in the center, so if I make this quilt I have to choose some different color combinations. I hope this gives you some inspiration to play with this technique! I love IT! 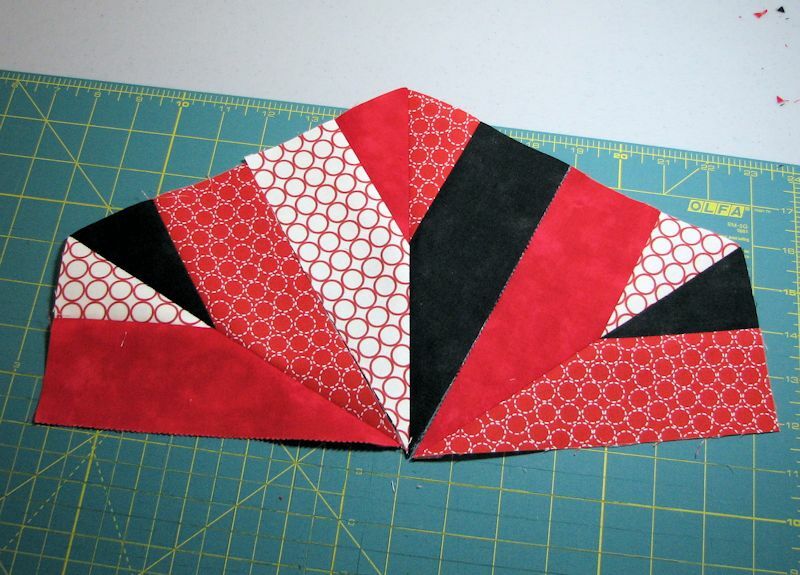 I have been wanting to make a kite in the sky for a wall hanging. Now I can! Thanks!